On this page you can find machine learning examples using Vaimal. You can get a feel for how Vaimal handles a data set and its reporting capabilities. The Iris data set is a classification problem with 3 classes. Three models were trained: Support vector machine (SVM), multilayer perceptron neural network (MLP), and probabilistic neural network (PNN). 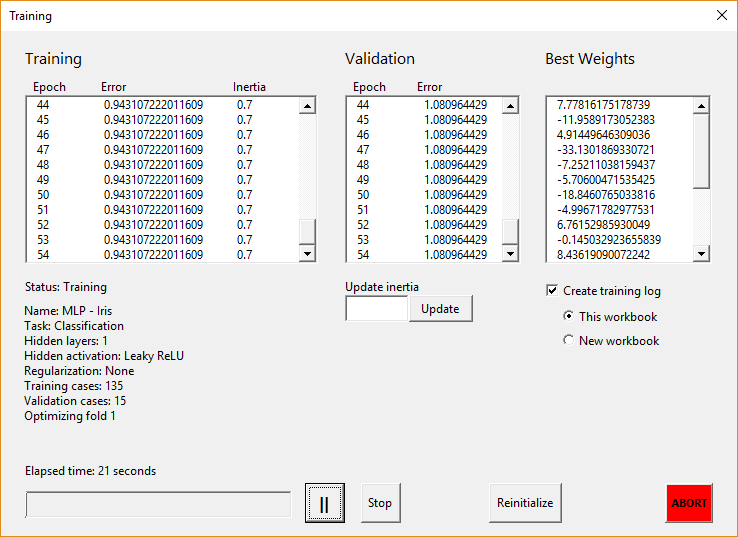 Due to the limited size of the data set (150 points), k-fold cross-validation was performed to estimate classification accuracy. Then each model was trained on all data after k-fold. SVM bagging ensemble with polynomial kernel, over-sampling. Multi-layer perceptron (MLP) neural network with 1 hidden neuron, under-sampling, and L2 regularization. Data was stratified into the train/validation/test partition. The airfoil data set is a regression task. There are five input variables, and one dependent variable. Generalized regression (GRNN) and multilayer perceptron (MLP) neural networks were trained. A voting ensemble was created to combine all basic models. The models were trained using hold out cross-validation and tested on a separate testing set. Data flagged as TRAINING was used to train the models. Data flagged as VALIDATION was used to calculate validation error. Data flagged as TESTING was used for testing after training. Data was randomly selected for training, validation, and testing. Input data was normalized on [0,1].